I owe it to him. Really, I do. Poor hubby has never had a real office at home. I've always set up a desk and bookshelves for him in a room that started out as an office, but then I would turn it into the catch-all room and force him to resort to the kitchen table for a desk. It's time he has a place to call his own. A place that I do not eventually take over. But, that's not what this particualr post is about. This post is about his window treatment. 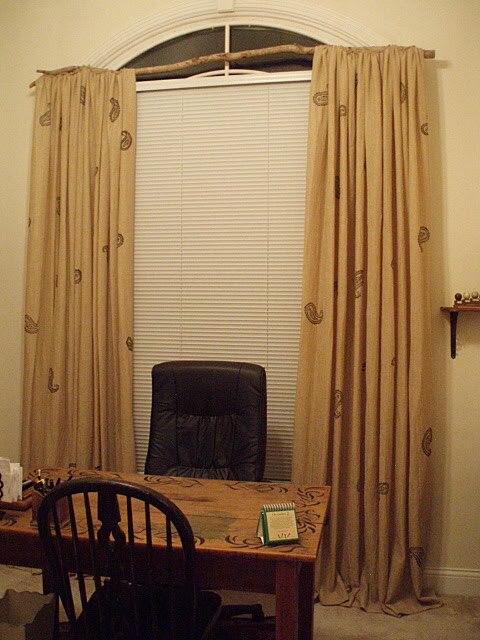 Drapes fit for a man's office - finally. 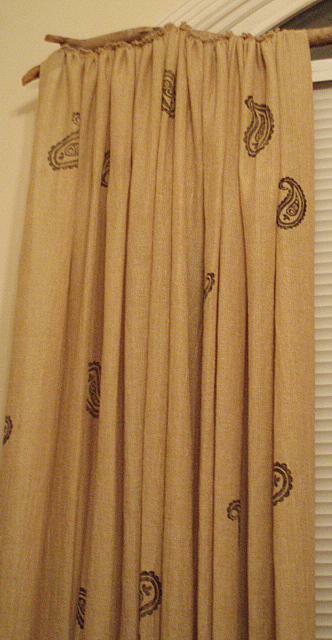 I've been schlepping around a set of pinch pleated drapes left over from a job I did several years ago. I somehow made an extra set. Don't know how. 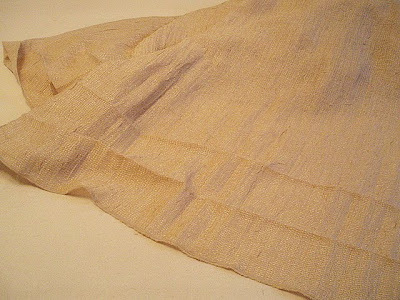 Anyhoo, they are a very nice fabric, silk blend, crepe looking, neutral fabric that is easily adaptable to any setting. Problem is, they were about 112" long, and you can't use that just anywhere without altering them, and shortening them was more work than I wanted to do. But, when we moved I suddenly had the perfect window. I decided to use them in hubbys office, but they were so bland and that office needed a bit of color. 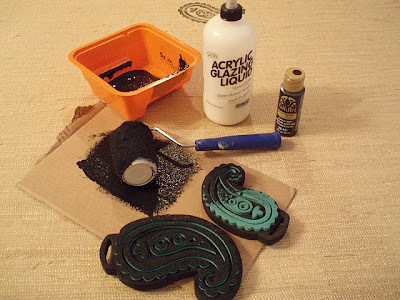 Remember my paisley stamped blocks? I actually bought those stamps for these drapes. To start, I had to remove all of the pleats and crinolin at the top. Then I layed them out on the table and ironed the folds out from the pleats. Sure helps to have a big table (which I'll show you how to build tonight). 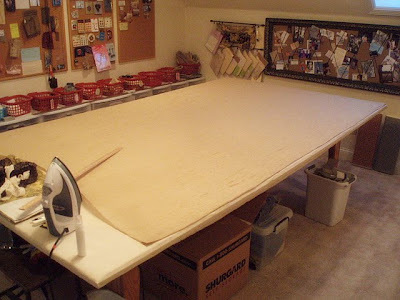 These things are 108" wide x 112" long - each. But being sheer, they scrunch down to give a nice full look. I gathered a few supplies. I used acrylic paint for this but thinned it down with a clear satin glaze. I wanted my jet black to be a bit softer, and the glaze really helps. I decided to just start stamping and see where it took me. But before I put the stamp on the face of the fabric, I tested to see how it was going to work. I flipped over the hem and did a test stamp. I liked it, so I jumped right in with the stamping. I kept stamping. I first used the large stamp all over, knowing that I would fill in with the smaller one after it was dry. I was going for random, and not too full. I really like the way the stamp looks on the fabric. After I finished both panels, I decided to gather them at the top so that it would make it easier for me to staple them to the tree branch I wanted to use for the rod. Off to the ruffler I went. All the ruffling is done, and the drapes are ready to be hung. Here they are in place. I screwed drapery brackets into the branch and hung them just like you would a regular rod. I Love them. And more importantly, hubby loves them. I'm a puddler. 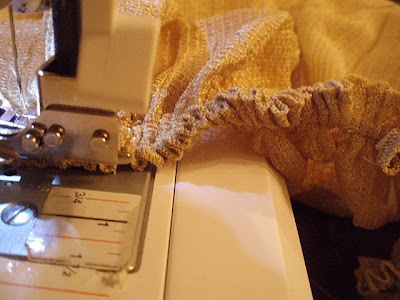 Puddling your fabric helps to weigh it down and keeps your folds in place. And besides, I love the way it looks. Now that these are in place, it's time to get the rest of the office pulled together. I've put all of the furniture in place and I've encouraged hubby to decorate his own office, his own way. When he's done, I'll come back and let you see it. EDITED TO ADD: Just for kicks, I thought I'd throw in a pic of what this window was wearing when we moved in to this house. I'm linking up to a few parties. 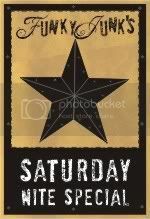 Funky Junk's weekly Saturday Night Special. If you haven't checked that party out, you're really missing a lot of great projects. Those curtains (and rod) are spectacular! You did such an awesome job girl!!! 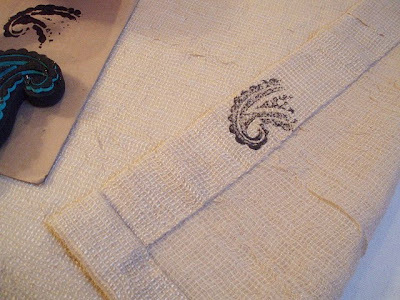 The paisley stamps turned out beautifully, Polly! What a great looking fabric, too! I love the way it falls. I'm sure your hubby is thrilled to have his own space. Can't wait to see how he decorates it! The drapes are fabulous. I love the paisley look on the pretty fabric, and yet it is perfect for a man's office. I tried to stamp on cotton napkins and it didn't work. I noticed you thinned the paint down, maybe that was my mistake. I love the tree branch 'rod' too!! So cool!! You did a great job and I hope you post pictures of the whole office when it is done! Those are fantastic curtains! Great job. Love the paisley stamp. It adds the perfect touch! Ahhhh, much better ! I really like the stamping on the fabric. The curtains are fabulous. 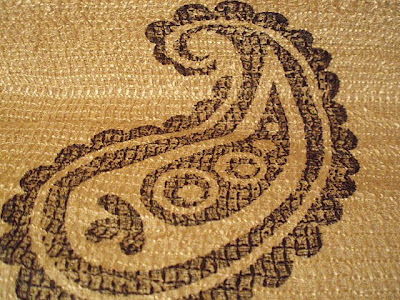 I love the texture of the fabric itself and the stamping enhances that for sure. I always puddle my drapes...I too love the look! You did a wonderful job, Polly! And very masculine too. 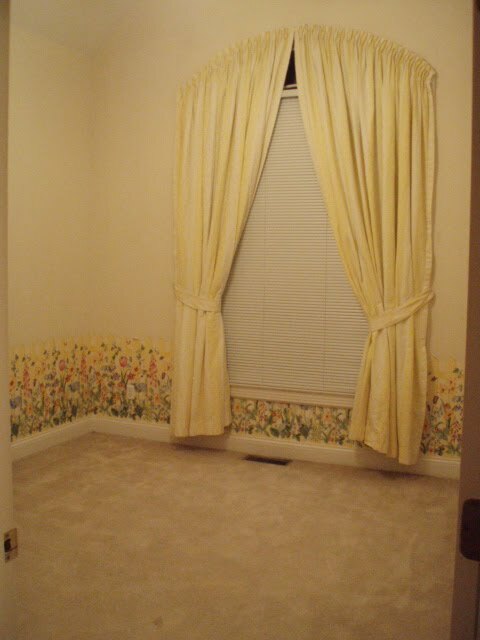 What are people thinking with that wallpaper and window treatment? I can only imagine. The drapes look great...I can see why your husband loves them. What a transformation already on that room. Wish I had your energy!!! They look so nice! 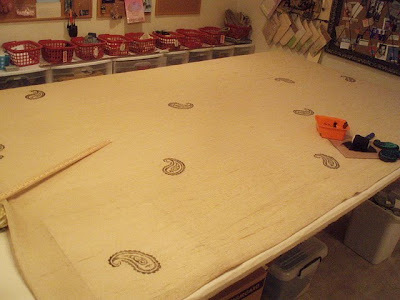 I would love to learn how to stamp fabric better. I seem to have some trouble. I love the paisley stamp! Branches for curtain rails - love it!!! Stopping by from Metamorphosis Monday. Oh my lands!!!! I am really amazed at your creativity and ingenuity! Job well done girl! What a beautiful transformation! Love the black and brown combination. Hubby has to be so pleased! This is a great idea.I think I will try to do this with my boys rooms. Thanks for sharing this with us. Polly, those are ssooo creative. I love the stamp idea. I have hundreds of yds of scrim, I bet I could come up with an idea for now. 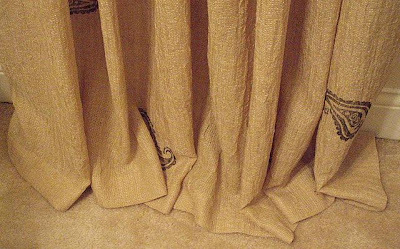 I love puddled drapes too. Hope your hubby enjoys his room. So sorry to read you were sick. I have had a sinus infection too that has lasted over 2 weeks. It gave me bad headaches, nothing like you described, but enough to feel really bad for you. Sure wish I had room for a work table like you are going to show how to build. 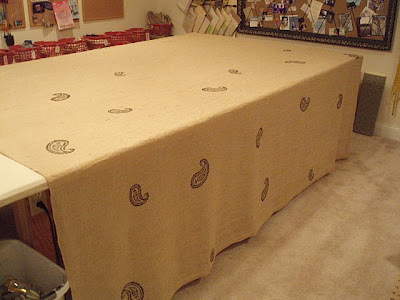 But I am anxious to show my hubby, because I keep telling him that is what I need when I make drapes....maybe he could make one for the garage. What a great project! The curtains turned out fantastic! 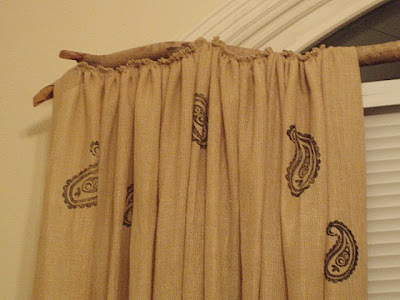 Love these curtains AND that rod!!! I won your heart key tray on Cheri's blog! If you will e-mail me, I will send you my address. I am so excited that I won this, I have a "thing" for keys! 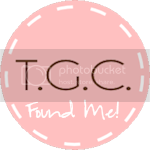 I am a follower ~ your blog is great! What an improvement. That window must be happy! Love the wood you used to hang them too! I'm hosting a party and would love to have you come over and link up! I came over from Funky Junk feature of your drapes. Somehow I missed them last week. They look so beautiful, I love that rod idea!